No matter what holidays you celebrate it's a good chance that your traditions involve food and cooking. The end result of cooking is delightful - turkey, stuffing, ham, collard greens, macaroni and cheese, oh my! To get to those dishes, however, it takes a lot of work and preparation if you are the hostess. You have to clean before guests arrive, and then again after everything has been prepared. I have been really neglecting my oven cleaning and now that the holiday season has come around I have to get things right! I'm afraid of the self-cleaning oven feature so I choose to clean it by hand instead. 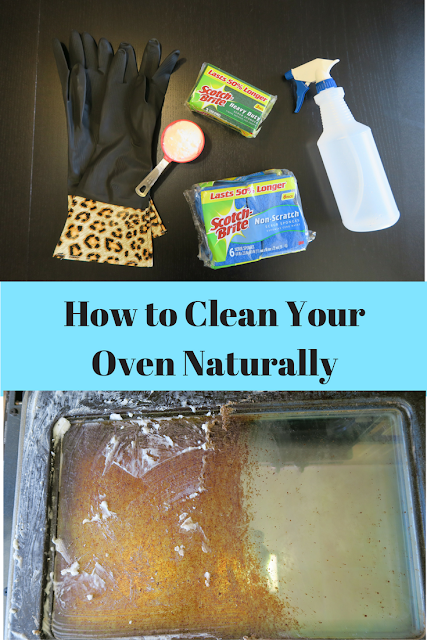 Rather than using a commercial cleaner I use a combination of vinegar and baking soda to clean the oven. Add 1/2 cup baking soda to a bowl. Add warm water one tablespoon at a time until you have a paste consistency. I used four tablespoons of water. Spread the baking soda paste on the trouble spots in your oven. For me this was my entire oven door! Spray the vinegar on the baking soda paste until it's saturated enough for the baking soda to bubble up. Let the paste/vinegar mixture sit for at least a half hour. After the paste has had time to settle scrub away with your Scotch-Brite Heavy Duty Scrub Sponge. After you've scrubbed out all the stains you can use the softer side of the sponge to wipe away any baking soda residue. When you use the right tools for each surface, cleaning your home will be easier and faster. The green sponge is the Scotch-Brite Heavy Duty Scrub Sponge while the blue is Scotch-Brite® Non-Scratch Scrub Sponge. The Scotch-Brite Heavy Duty Scrub Sponge works great for this job and is also recommended for garage and outdoor use. The Scotch-Brite Non-Scratch Scrub Sponge is good for counter-tops, non-stick cookware and dishes. Find more tips and tricks on cleaning your biggest messes HERE. Wow! I will try it out. (Added step - corral the crawler into another room first haha) Thanks for the tip! I'm going to have to try this. I've heard so many mixed results but I like the technique you used. I so need to try this! It's been a year since we moved into our brand new house and I have yet to clean our oven! Yes!! Love these ingredients!! My oven is going to get a post-Thanksgiving, pre-Christmas cleaning with this! Likewise in the event that you are hoping to go somewhat more green and in the meantime lessen your electric bill, these ledge ovens execute and additionally your full size oven utilizing significantly less power.